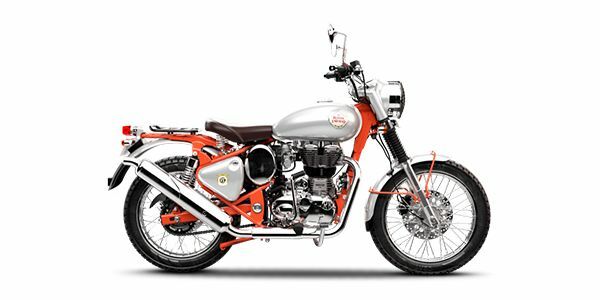 Royal Enfield has launched the Bullet Trials 350 at Rs 1.62 lakh (ex-showroom, India). It's an off-road variant of the Royal Enfield Bullet 350 and commands a premium of Rs 9,100 over the Classic 350. Being a Scrambler, the Bullet Trials 350 gets adventure-friendly bits like a raised rear fender, dual-purpose tyres and an upswept exhaust system. However, powering it will be the same 346cc, single-cylinder engine that churns out 20PS of power and 28Nm of torque. Considering its pricing, it currently faces no competition. Royal Enfield Bullet Trials 350 prices start at Rs. 1.63 lakh (Ex-Showroom). Royal Enfield Bullet Trials 350 is available in 1 variants and 1 colours. Share your experiences with Trials 350? The claimed ARAI mileage for the Royal Enfield Bullet Trials 350 petrol is 40 kmpl. Q. Which one is better Classic 350 or Trials 350? Q. Can we fit an other seat at the back? Engine Power & Torque , Tyre size are same as RE 350. 80 mm length is reduced , 5 kg weight reduced. Projected as off roader. All are gimmick to push sales nothing more. Confused about Royal Enfield Bullet Trials 350?